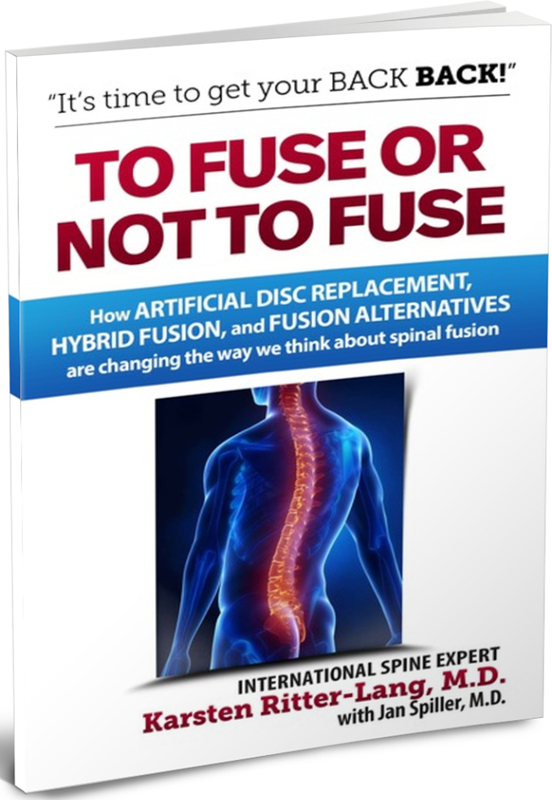 In this new book Spine Surgeon Dr. Ritter-Lang explains how Artificial Disc Replacement, Hybrid surgeries that may include multiple types of intervention, and Fusion Surgery Alternatives are changing the way we think about the "Gold Standard" Spinal Fusion Surgery. THE FUTURE OF artificial disc replacement and fusion alternatives in general is very exciting. After the decades of early experimentation with disc implants in the 60s, 70s and 80s, we have really reached the “golden age” of disc replacement. The 90s saw (for some of the world anyway) the general establishment of disc replacement as a viable alternative to spinal fusion, and the last 15 years have allowed the perfection of the surgical procedures and the development of ideal hardware solutions. This is an incredible time. Artificial disc replacement has moved far beyond the experimental stage and is now recognized as an established and highly successful method for treating a variety of spinal conditions. While disc replacement is still limited in application in the U.S. and Canada, it is now considered the preferred and state-of-the-art alternative to spinal fusion in most of the developed world. Even in the U.S. and Canada, disc replacement is starting to take hold, though it may be many years before U.S. and Canadian surgeons (and their teams) develop the level of experience that can be found elsewhere. With the increased utilization of disc replacement, hybrid solutions involving disc replacement with fusion are now being used more frequently to treat conditions where disc replacement alone is not appropriate. This means more people are receiving the benefits of disc replacement to the greatest extent possible, and more people are returning to fully-functional lives. The future of fusion alternatives is very promising. Building on the work that has been done, there will certainly be new implants introduced. While I find this exciting, I know that any improvements from new implants will be very incremental in nature. The current state-of-the-art devices are extremely solid and reliable, and it is difficult to imagine any dramatic improvement. The greatest likelihood of change will come in the devices and procedures approved in North America, which is sadly lagging the rest of the developed world in this area. In the next five to ten years, we will likely see some of the best devices used in the rest of the world finally coming to use in the U.S. and Canada. Maybe someday we will see more multi-level disc replacement options approved by the FDA. Even then, the depth of experience in providing multi-level ADR may be lacking. Until then, patients desiring the best devices, multi-level options, and hybrid solutions may continue to look to Europe. We now have decades of experience with modern implants and procedures, and the results are extremely favorable. After more than 4,000 successful disc replacement surgeries (and over 6,500 implanted devices) performed by myself and my team, I have had a chance to witness incredible recoveries, including patients who have returned to professional horseback riding, Iron Man triathlons, competitive volleyball, professional golf and much, much more. As exciting as these stories are, the most important stories are far more poignant: the man who can return to work and support his family; the woman who can walk after being told she would be confined to a wheelchair; the young father whose back pain restricted him to living on the floor but who now can live a normal life and be the dad he always wanted to be. These are the stories that make me so excited about what we do. The future will be even better. More and more people will get to benefit from disc replacement. And we will hear more and more success stories and see more lives changed. It is an honor to have been part of the history and development of disc replacement, and it will be a greater honor as we move forward into its future.